After seven decades, it’s difficult to appreciate the influence of Disney’s Snow White and the Seven Dwarfs. If you want to understand more about Snow White ‘s place in film history, the two-disc Blu-ray set will leave you wanting more. If you want to know the nitty gritty details of the making of the movie, you’ll be satisfied. If you just want to watch the movie, you’ll find a beautifully-restored edition and a movie that stands the test of time. Also on the commentary track, Walt Disney himself tells us that animated films didn’t get much respect in the 1930s. They were considered filler before the main attraction. The shorts that his studio cranked out were becoming less profitable, and it was time to try something different. Many power players in Hollywood, even Mrs. Disney, thought that adults wouldn’t pay to see a full-length, animated, fairy tale movie. In order to succeed financially, they would have to get the movie exactly right. Animators were sent to art classes, book illustrators were hired to create a look for the movie. It seems that every aspect of the movie was discussed, refined, and discussed some more. Has there ever been a movie princess as sweet as Snow White? Her sweetness and high-pitched trilling voice (Adriana Caselotti) got on my nerves sometimes. But her sweetness balances out the evil of her stepmother, the queen (Lucille La Verne), who surely deserves to be remembered as one of the nastiest movie villains ever. The movie succeeds marvelously in provoking an emotional response from the audience. The sequence where Snow White gets lost in the woods is effective and scary. The pans and zooms add to the tension and give the movie a more cinematic feel. Contrast this with Disney’s short cartoons from that era, which tend to have the action unfold before a static camera. The quality of the animation itself was also a step forward. Many characters in Disney’s Silly Symphonies series remind me of those learn-to-draw lessons where you’re supposed to make figures by putting a bunch of ovals together. By contrast, the humans in Snow White look and feel like humans. As personalities go, the dwarfs just about steal the movie, even though it’s sometimes hard to tell Bashful, Sneezy and Sleepy from one another. Snow White and the Seven Dwarfs is still entertaining after 72 years. Some parts of the movie may be too treacly for adults. Other parts may be too scary for very young children. Even if you don’t care about the quality of the animation, Snow White is fun to watch. It may not be everyone’s cup of tea, but it was a great achievement in its time. The commentary track on Disc One is built around old interviews with Walt Disney. He tends to talk about the business end of his movies. Animation historian John Canemaker fills in the rest of the commentary with some interesting observations and a list of possible names for the dwarfs (Wheezy, Puffy, Jumpy, Burpy, Baldy, Gabby, and much more). His comments about Snow White ‘s influence on movies are tantalizing, but just when I was hoping to learn more, it was time for another audio clip of Walt. A modern music video with Tiffany Thornton singing Someday My Prince Will Come is skippable, as are the promos for other Disney properties. There’s also an extended sneak peek at The Princess and the Frog, Disney’s newest animated film. There are two scenes that were deleted from Snow White; one is in the pencil stage, the other is shown in combination of pencil animation and storyboard drawings. Snow White Returns is an eight-minute featurette about sketches for a proposed short film starring the dwarfs. In the Games and Activities section, Mirror Mirror is a little quiz to help the viewer find her inner princess. The best game on the DVD set is Jewel Jumble, a cross between Tetris and Bejeweled, which calls on the player to help Grumpy collect gems. The meat of Disc Two is Hyperion Studios, which offers a virtual tour of Disney studios circa the mid-1930s. Pressing the arrow keys on the remote highlights different departments. Each department has a set of features. In the Art Department, we can learn about Albert Hurter and Gustav Tenggren, two European artists who contributed to the look of Snow White. There are galleries of concept art, Music Land, a 1935 Disney short that illustrates the European-influenced look, and an audio recreation of a meeting of Walt and the artists. The Story Room, the Music Room, the Sweatbox (the poorly-ventilated screening room) and other departments can be visited on this tour. Along the way are numerous audio and video clips, galleries, featurettes and short films. The decentralized organization makes the material approachable. The shorter, smaller features fit well into their categories. For those who don’t want to mess around with navigating through old photographs, there’s an index page with a list of everything. Features that have been viewed have a red checkmark, and the disc remembers what you’ve seen, even after being removed and replaced in the player. The One that Started It All is a 17-minute movie about Snow White that piles on the Walt-worship. Much of the information is repeated elsewhere in this Blu-ray set. Anyone wanting to know about the movie would be better served taking the virtual studio tour. The other section on Disc Two consists of bonus features from the 2001 DVD release of Snow White. The best of these is Animation Voice Talent (six minutes), which has a self-explanatory title. Disney Through the Decades is a 41-minute history of the studio’s triumphs. It’s the kind of cheerleading video that could be shown at a stockholders’ meeting. The three-disc set reviewed here has the two Blu-ray discs and one standard DVD. The standard DVD has the movie, the Tiffany Thornton video, the commentary track, and the movie promos. 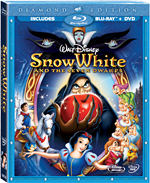 A two-disc standard DVD set of Snow White will be released in November, 2009. It’s possible that the picture is too good. Some elements — a moving dwarf, a tree branch — are occasionally out of focus. You may have to look hard to notice it. That’s how good the restoration is. If you have a wide screen television, you can choose the Disney View option, which fills the gaps on the sides with artwork. Sometimes it’s a continuation of the forest; sometimes it’s a set of curtains. The movie looks fine without this enhancement, but if you really can’t stand the black bars on either side, give it a try. The sound is DTS-HD 7.1, and it’s excellent. The Blu-ray also has a Dolby Digital mono track, and Spanish and French language tracks. After watching the movie, check out the studio tour on disc two. Go back to disc one for the commentary track later.